Progression occurs through a variety of pathways. 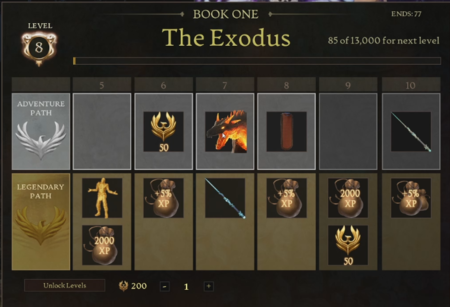 Repetition will not be part of progression in Ashes of Creation. The objective is to provide both vertical and horizontal progression. The level cap at launch is expected to be around level 50. The developers anticipate max level should be attainable in approximately 45 days. Repetition will not be part of progression in Ashes of Creation. There will be no "grindy" quests. There will not be repetitive quest lines through a single dungeon to obtain gear. The aspiration is to have more things to do in the game than a player has time to do. There will not be AFK leveling in Ashes of Creation. As a player progresses with their primary archetype (primary class), they will have the opportunity to choose a secondary archetype to augment their primary skills with effects from their secondary archetype (secondary class). The combination of primary and secondary archetypes is referred to as a Class. 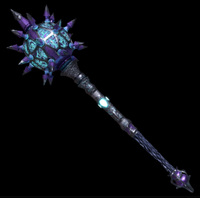 If a Fighter were to choose Mage as a secondary archetype, the fighter would become a Spellsword. This combination opens up augments that can be applied to skills in their primary skill tree. Fighters have a Rush skill that allows them to rush towards a target; and upon reaching the target, deal an amount damage with a chance to knock the target down. 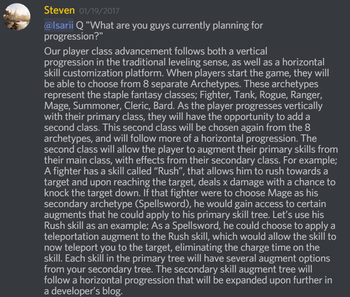 A Mage's escape augment could be applied to the rush skill, which would now teleport the player to the target; thus eliminating the charge time on the skill. Each skill in the primary tree will have several augment options from the secondary tree. This is an example of horizontal progression. Augments to primary skills will fundamentally change the way the ability works - adapting what the ability once did to incorporate the identity of the secondary archetype/class. Players receive skill points as they level. These can be used to level up skills within their skill tree. It will not be possible to max all skills in a skill tree. With 8 Archetypes to combine, players may choose from 64 total combinations to create their class. Pre-alpha footage of a Mage using offensive and Utility skills, such as Mage's escape and Mage's detection. Primary skills (class abilities) are based on a player's archetype. Players can personalize their primary skills with augmentation from a secondary archetype (secondary class). Augments to primary skills will fundamentally change the way the ability works - adapting what the ability once did to incorporate the identity of the secondary class. Choosing the same primary and secondary archetype increases focus on that archetype. 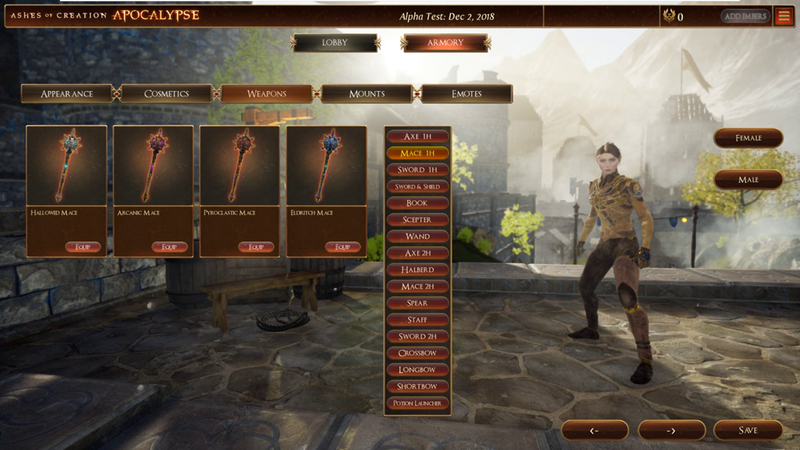 Each skill in the primary tree has a minimum of four augment choices from the secondary tree. 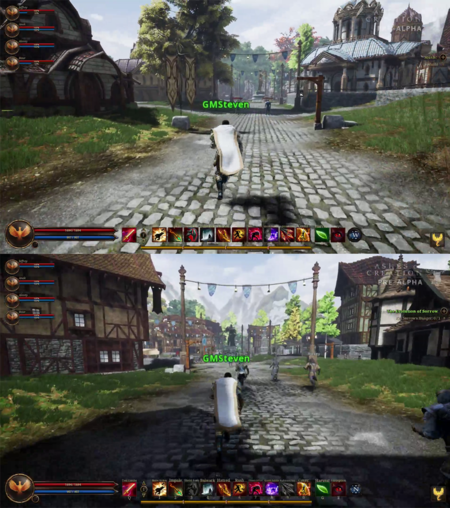 In terms of skill progression, players can choose to go "wide" and get a number of different abilities, or go "deep" into a few specific abilities. Changing the augmentations on your skills will require you to go to a NPC in a Village node or higher. Active skills could look totally different after an augment gets applied. Weapons will have their own progression paths and their own applicable types of skills. Currently the weapon use ability/combo determines special effects that proc. This system might change to adapt to weapon progression. Ancillary effects proc based on enchantment types. Gear enhancements (power stones) can be applied to add elemental or energy types of damage. A skill tree is used to grant effects: making them better or branching off into different directions. 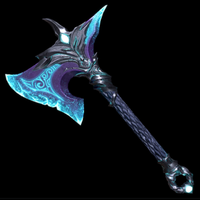 Passive skills will enable players to work toward mastery of a weapon. Weapon proficiency (based on length of use of a weapon) is not a planned feature. Q: Are weapons balanced towards a proficiency system (i.e. the longer I use a sword, the better my damage will be), or will it be a normal RPG stat system with no long-term scaling? 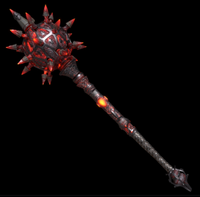 Gear enhancements (power stones/runes) can be applied to weapons to add elemental or energy types of damage. Enchanting services are sold at player stalls. There isn't RNG in crafting but there may be a small amount of RNG in enchanting. 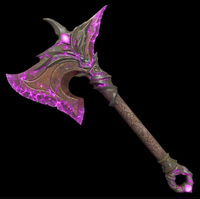 Over-enchanting items may come with a potential risk that the item is destroyed. There are two types of enchantments for items: Vertical and horizontal. Vertical enchantments are a power progression for a crafted item. More damage or mitigations, added effects or bonuses. Horizontal enchantments are more situational. 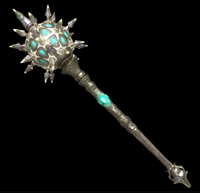 For example: I'd like my sword to do force damage instead of holy damage because the monsters I tend to fight are incorporeal. This doesn't make the item more powerful, but instead more applicable to different situations, and less so to others. This type of enchanting assumes no risk, just time and effort. Some pets will be levelable and will have gear available to them. 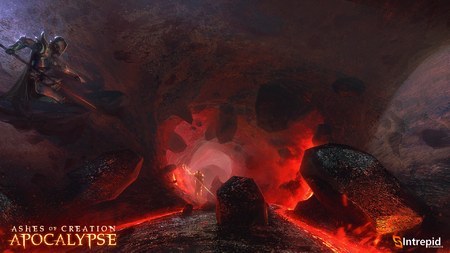 Discovery of legendary items will unlock further chapters of the Lore. There are absolutely legendary items and they're not items that are attained easily nor are they granted out in a volume. There might even be items that are single items that will exist on the server at any given time. A legendary weapon is easily distinguished by its visual appearance. Obtaining a legendary item will not be RNG based. It will entail obtaining construction components from various progression pathways. Legendary items are not intended to be temporary. A notable exception to this is Royal mounts. Mariner classes (also referred to as boatsmanship classes, boatsman skills or seamanship) contain different skill trees arranged in a similar manner to Artisan classes. As a player gains experience in these different skills they become more adept at using them. 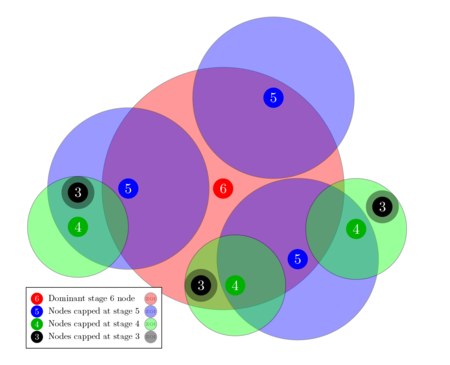 Illustration of node advancement from Expedition (stage 1) to Metropolis (stage 6). Citizen and non-citizen player activity (questing, gathering, raiding, etc.) within a node's ZOI counts toward that particular node’s advancement (progression). Nodes have seven (7) stages of advancement, with experience thresholds for each stage. When a Node reaches the experience required for its current stage, it advances to the next stage. Conceptual illustration. 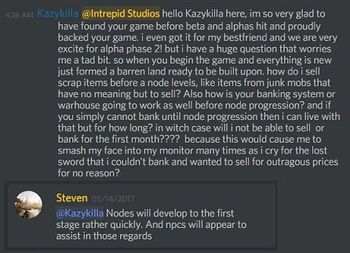 Nodes that are in the ZOI of more advanced nodes have their progression capped by the more advanced node. The advancement of a node unlocks its unique content, which comes at the cost of locking out an increasing ring of neighboring nodes from progressing to the next stage. Nodes advance to the first stage quickly. This enables NPC services such as vending or banking items. The more advanced the node is, the larger its ZOI becomes. Less advanced nodes (referred to as vassal nodes) that fall within a more advanced node's ZOI can still gain XP, but must remain at a lower advancement stage than the dominant node. A node does not receive XP from the nodes within its ZOI until these nodes have reached their cap. Players are moved to safety if they intersect with newly spawned assets during node advancement. Citizens of one node can contribute to the advancement of other nodes. The exact percentage of advancement from obtaining items or killing monsters is not going to be explicitly known to avoid "gaming" the system. Nodes greater than stage 3 (Village) enslave nearby nodes, converting them into vassal nodes. Vassal nodes must remain one node stage below their parent node. Vassal nodes first apply any experience earned to their own deficit (see Node atrophy). It then applies excess experience earned to its parent node. If the parent node advances, the vassal is once again able to advance. Vassal nodes give excess experience to their parent node and may have their own vassals; so long as they fall within the parent node’s zone of influence. If a node is capped and is both a vassal and has its own vassals, any experience earned from itself or its Vassals is first applied to its own deficit. Experience beyond that is then sent to its parent node. Vassals are subject to the government, alliances, wars, taxes, and trade of their parent node, and are able to receive federal aid from them. Vassal nodes cannot declare war on their parent node or any of their vassals. Citizens of vassals are bound by the diplomatic states of the parent node. Racial architecture styles in an Alpha-0 village node. Empyrean Elven influence (top). Kaelar Human influence (bottom). Race that contributed most to the node's advancement. Racial appearance of a node's buildings and NPCs. This applies to all nodes, including castle nodes. The rest is determined by the node's mayor. There is an attrition mechanic that affects experience and influence to curb a single race from dominating the entire world. Dungeons, Raids, World bosses, Mobs, Quests, Events, Resources, Narratives and other content within a node's ZOI will have a diverse level range; but will scale with the advancement of that node and it's racial influence. We don’t have a strictly level 25 zone. Instead, that zone might have some level 10 creatures near the road, some level 20 creatures deep in the forest, and some level 30 creatures up the mountain. These ratios will change based on the Nodes that inform them, becoming generally more dangerous as the Node grows. All this civilization attracts the attention of Things-That-Should-Not-Be. This does not mean that wilderness areas are safe, by any means. Some may be safe-er, but all will have dangers that even the most experienced traveler needs to watch out for. Guild progression occurs through participation in different systems. Passive skills and augments are unlocked by guild progression. Passive abilities increase certain stats relating to a guild member's ability to perform in combat or in other aspects of the guild, such as the economy. Augments may apply at the upper tiers of guild progression. This Applies to guilds that have opted for the non-expansive member route. It benefits guild members with a classification of officer or knight. Guild size can be traded off for guild progression. The higher the guild's member cap, the fewer available skill options will be available to that guild. Guild alliances may be a key part in creating a larger "guild". There is a progression system that levels a player's monster skills based on how often they participate in monster events. In Ashes of Creation a large portion of world events revolve around the environment reacting to the player. This means that as players are exploring the world and developing civilization around them the environment is responding to this encroachment by spawning dynamic events and creatures to attack those developing cities. These events occur in 3 different types: the Legion level the Elite level and the Epic level. As nodes advance, so does the scale of the monsters. There are tiers of events denoting the caliber of the monsters being spawned. ↑ Livestream, 19 May 2017 (51:52). ↑ Livestream, 12 May 2017 (42:17). ↑ 3.0 3.1 Interview, 20 October 2018 (1:55). ↑ Livestream, 8 April 2018 (PM) (28:38). ↑ 5.0 5.1 5.2 5.3 5.4 5.5 5.6 5.7 5.8 2018-12-08 Newsletter. ↑ 6.0 6.1 Livestream, 6 December 2018 (28:45). ↑ 7.0 7.1 7.2 7.3 7.4 7.5 7.6 7.7 7.8 7.9 Livestream, 6 December 2018 (33:55). ↑ 8.0 8.1 8.2 8.3 8.4 8.5 8.6 Livestream, 6 December 2018 (26:12). ↑ 9.0 9.1 9.2 9.3 Livestream, 6 December 2018 (51:20). ↑ 10.0 10.1 Livestream, 6 December 2018 (1:00:52). ↑ 11.0 11.1 11.2 11.3 11.4 11.5 11.6 11.7 Livestream, 31 October 2018 (38:47). ↑ 12.0 12.1 12.2 12.3 12.4 12.5 Livestream, 27 September 2018 (27:27). ↑ 14.0 14.1 14.2 Livestream, 6 December 2018 (41:43). ↑ 18.0 18.1 18.2 18.3 Bronze Axe Skins. ↑ 24.0 24.1 24.2 24.3 Thundering Mace Skins. ↑ Livestream, 24 May 2017 (46:27). ↑ 30.0 30.1 30.2 30.3 Video, 5 April 2018 (40:08). ↑ 31.0 31.1 31.2 31.3 31.4 31.5 February 8, 2019 - Questions and Answers. ↑ Livestream, 15 December 2017 (58:48). ↑ Livestream, 24 May 2017 (19:25). ↑ 34.0 34.1 34.2 Livestream, 15 May 2017 (26:13). ↑ Interview, 24 August 2018 (4:15). ↑ 36.0 36.1 Livestream, 27 September 2018 (52:41). ↑ 40.0 40.1 Ashes of Creation class list. ↑ 41.0 41.1 41.2 41.3 Livestream, 28 July 2017 (19:05). ↑ Video, 7 February 2017 (0:02s). ↑ Livestream, 9 February 2018 (41:56). ↑ Livestream, 16 November 2017 (30:02). ↑ Livestream, 8 April 2018 (PM) (20:45). ↑ 48.0 48.1 Interview, 11 May 2018 (53:15). ↑ Livestream, 16 October 2017 (1:00:44). ↑ Interview, 8 August 2018 (22:27). ↑ 51.0 51.1 Livestream, 4 May 2018 (45:37). ↑ 52.0 52.1 52.2 52.3 52.4 52.5 Livestream, 4 June 2018 (1:11:19). ↑ 53.0 53.1 Livestream, 4 June 2018 (21:37). ↑ Livestream, 17 May 2017 (58:55). ↑ Interview, 20 October 2018 (2:53:52). ↑ 60.0 60.1 Livestream, 24 May 2017 (32:07). ↑ 64.0 64.1 Interview, 11 May 2018 (38:25). ↑ Livestream, 19 May 2017 (44:18). ↑ Livestream, 15 May 2017 (38:08). ↑ 68.0 68.1 68.2 68.3 Livestream, 8 April 2018 (PM) (55:49). ↑ 69.0 69.1 Livestream, 9 July 2018 (25:34). ↑ Livestream, 8 April 2018 (PM) (51:49). ↑ 71.0 71.1 71.2 Livestream, 8 May 2017 (44:51). ↑ 74.0 74.1 Livestream, 9 July 2018 (36:05). ↑ 75.0 75.1 75.2 75.3 75.4 75.5 Blog - Know Your Nodes - Advance and Destroy. ↑ 76.0 76.1 76.2 A reactive world - Nodes. ↑ 77.00 77.01 77.02 77.03 77.04 77.05 77.06 77.07 77.08 77.09 77.10 Blog - Know Your Nodes - The Basics. ↑ 79.0 79.1 Node series part II – the Metropolis. ↑ 80.0 80.1 80.2 Livestream, 16 October 2017 (50:20). ↑ Video, 20 April 2017 (0:02). ↑ Livestream, 17 November 2017 (55:27). ↑ 85.0 85.1 Livestream, 26 May 2017 (28:16). ↑ 87.0 87.1 87.2 87.3 87.4 87.5 Livestream, 27 September 2018 (53:06). ↑ 88.0 88.1 Interview, 11 May 2018 (54:34). ↑ Livestream, 26 May 2017 (21:23). ↑ 90.0 90.1 Interview, 11 May 2018 (47:27). ↑ 91.0 91.1 Interview, 11 May 2018 (1:00:19). ↑ Livestream, 15 May 2017 (30:53). ↑ Interview: Ashes of Creation on Building Their Virtual World, 13 April 2017. ↑ 94.00 94.01 94.02 94.03 94.04 94.05 94.06 94.07 94.08 94.09 94.10 94.11 Livestream, 27 September 2018 (55:39). ↑ 95.0 95.1 95.2 Livestream, 19 May 2017 (22:10). ↑ 97.0 97.1 Livestream, 5 May 2017 (23:26). ↑ Interview, 8 August 2018 (9:36). ↑ 99.0 99.1 99.2 Livestream, 17 May 2017 (7:27). ↑ 100.0 100.1 100.2 100.3 Podcast, 11 May 2018 (18:52). ↑ 102.0 102.1 102.2 102.3 102.4 Podcast, 11 May 2018 (21:07). ↑ 103.0 103.1 103.2 Podcast, 11 May 2018 (48:29). ↑ 104.0 104.1 Livestream, 1 June 2017 (24:30). ↑ 106.0 106.1 106.2 106.3 Podcast, 23 April 2018 (29:56). ↑ Livestream, 3 May 2017 (31:46). ↑ Livestream, 3 May 2017 (36:25).